The piaffe is one of the most beautiful movements to watch. It is one of the gymnastically most useful movements, and it is in some ways the gateway to Haute École, similarly to the way in which the shoulder-in is the gateway to Campaign School dressage. Training the piaffe is a rite of passage for the aspiring Grand Prix trainer in a similar way that flying changes are a rite of passage from Elementary School to Campaign School. At the same time, you don’t see good piaffes very often because training it is not that trivial. I often think the piaffe is like a delicate flower that can easily be crushed by too much intensity, too much rider activity, or too much force. Shana and I wrote an entire chapter on piaffe training in our long reining book (Order through Amazon here), with a focus on work in hand and long reining, rather than riding. Most horses find it easier to learn the piaffe in hand, without the weight of the rider at first because they only have to manage their own weight. Lead the horse on a journey of discovery that diagonalizing his steps can be more energy efficient than walking or halting. When the horse discovers for himself that half steps or piaffe steps are less tiring than walking or halting, he will be happy to piaffe, and he will remain calm in the process. Utilize the principle of the Economy of Motion: The horse will always seek out the movement pattern that requires the least amount of effort under the given circumstances. Every horse is a little different. Not every exercise will work for every horse. Most of them have a certain type of exercise that makes sense to them and gives them the right idea. Some of them find it very difficult to diagonalize their steps. They tend to piaffe in 4 beats or in lateral steps. They often need the cumulative effect of all possible paths over a longer period of time before they find the piaffe “gear”. First phase: Walk - halt transitions into all 4 legs (OF, OH, IF, IH) by using the stirrup and rein pressure on the same side when the leg that is addressed is on the ground. Second phase: Slow the horse down into all 4 legs at the walk (OF, OH, IF, IH) by using the stirrup and rein pressure on the same side when the leg that is addressed is on the ground. Address each leg twice in a row and energize the horse with your calf or a quick, light vibration with the whip. This redirects the energy of the movement from a horizontal trajectory into a vertical trajectory, i.e. the strides become shorter and higher. From a certain point on diagonal steps are more energy efficient than the 4 beat rhythm of the walk. Observe from which horse leg you get the best response. Very often it is a front leg. The reason is that the tempo (steps per minute) of the piaffe is faster than the tempo of the walk. One easy way of speeding up a certain leg is to shift the weight away from it, whereas if you shift the weight onto a specific leg, it will tend to move more slowly. So, if you shift the weight onto the forehand, the hind legs can lift off sooner and speed up, which helps the diagonalization process. It makes it easier for the horse to get into the piaffe. Once the horse is in the piaffe, you can shift the weight back towards the hind legs again - provided they are strong enough to support the weight in the piaffe. Halt square next to the arena wall. Ask the horse to lift his inside hind leg, advance one hoof’s breadth so that each leg moves once, and halt square again. This also changes the mechanics from a long, flat movement to a shorter, higher movement. Do it slowly at first. Don’t allow the horse to evade backwards or sideways. Once this becomes easy, ask the inside hind leg to lift off again as soon as it touches down. This will also lead to a diagonalization of the steps. This is very similar to the previous exercise. In the Stop - and - go exercise the emphasis is on mobilizing the hind legs at the halt. Here the focus is on stopping briefly from the walk and moving off again. In other words, in the previous exercise the horse spends more time at the halt and here he spends more time at the walk. Try to initiate the up transition before all 4 legs have come to a halt. If the transitions are snappy enough and follow each other in a quick enough succession, many horses will diagonalize their steps. This exercise is based on the the same principle as the last one, but instead of riding walk - halt - walk transitions, you alternate between trot and halt or trot and walk. You can make the exercise more specific and more effective by riding the down transitions into the outside hind leg and then energizing the inside hind leg for the up transition. This means you half halt (e.g. with the outside rein + outside stirrup) when the outside hind leg is on the ground. The inside hind leg is in the air at the same time. The down transition flexes the outside hind leg, which enables the inside hind leg to lift off more quickly and easily, which you accentuate with your inside leg. The combination of increasing the flexion of the gounded hind leg and increasing the activity of the lifting hind leg leads to a diagonalization. 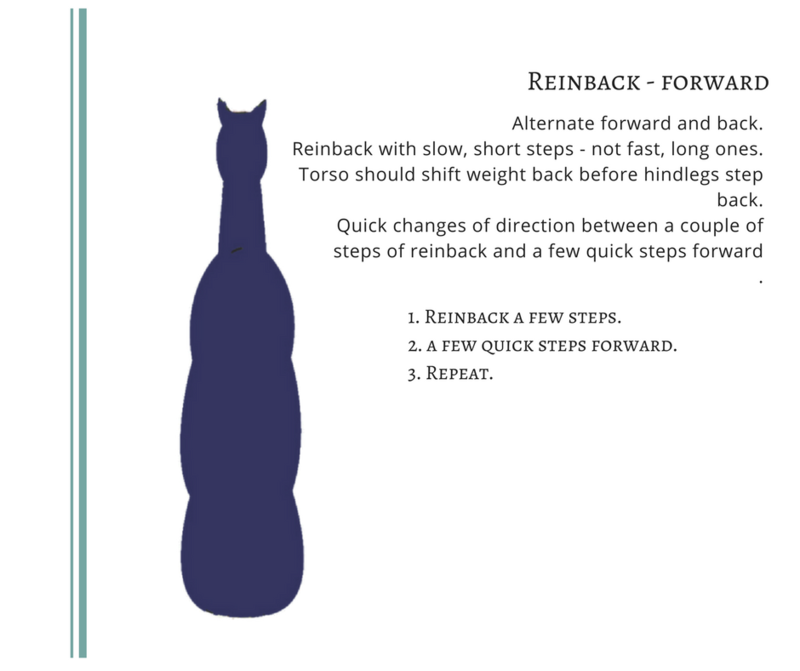 The reinback is a useful tool in piaffe training because it is a diagonal movement, and it flexes the joints of the hind legs more. It is important that the horse takes slow, short steps back, not fast, long ones. The horse’s torso should move back over the hind legs before the hind legs start moving backward. 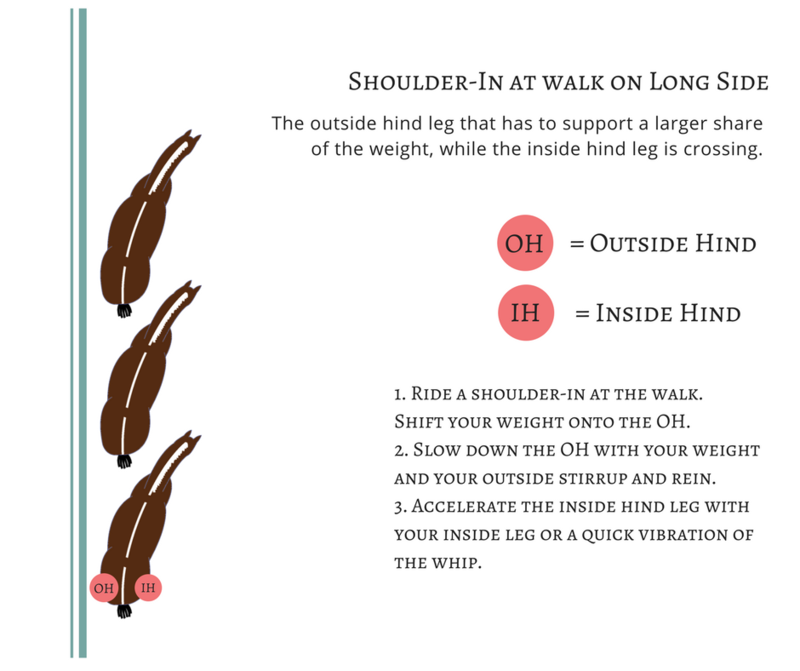 If the hind legs move back first before the torso has started moving back, the hind legs will simply run away from the weight instead of supporting it more. The more the joints of the hind legs are flexed during the reinback, the more relieved the horse will feel when he is allowed to go forward. Quick changes of direction between a couple of steps of reinback and a few quick steps forward can lead to half steps or piaffe steps. When you ride a shoulder-in at the walk, it is easy to slow down the outside hind leg and speed up the inside hind leg. The outside hind leg is the more carrying one in the shoulder-in. If you shift your weight onto the outside hind leg and slow it down with your weight and your outside stirrup and rein, you can accelerate the inside hind leg with your inside leg or a quick vibration of the whip. Many horses offer diagonal steps very quickly in this situation because they require less strength than the 4 beat walk rhythm. The effect increases if you ride shoulder-in on a curved line, like a volte or circle because the hind legs move on a larger circle than the front legs and have to cover a longer distance. If you activate the inside hind leg as the outside front leg lifts off, you can synchronize the main diagonal with each other. Your seat and half halt keep the outside hind leg grounded a little longer, your inside leg makes the inside hind leg lift off sooner, so that the 4 beat rhythm of the walk changes into the diagonal 2 beat rhythm of the piaffe. The principle behind this exercise is the same as in the previous one. Here it is the inside hind leg that has to support a larger share of the weight, while the outside hind leg is crossing. The deeper the flexion of the inside hind leg, the more freely the outside hind leg is able to move. Riding the renvers on a volte or circle intensifies the exercise and increases its effectiveness. A highly effective combination is to ride a shoulder-in first to engage the inside hind leg more underneath the body, then to shift the weight onto this hind leg by riding a 180 degree walk pirouette or passade, and to finish with a renvers in the opposite direction. Many horses will offer piaffe steps, if you flex the inside hind leg in the renvers while activating the outside hind leg. Horses that have a very high natural muscle tone and who push very hard with their hind legs sometimes respond well to a haunches-in on a small volte at the walk. If you slow down the inside hind leg with your weight, while you activate the outside hind leg, some horses will offer diagonal steps. The small circle in combination with the haunches-in position channels the energy of the movement in a vertical direction, and horses with a high natural muscle tone and high natural energy then re-organize their footfall pattern into a diagonal gait because it is more economic. Horses with low muscle tone who don’t push enough will probably be become tense and unrhythmic in this exercise. They will respond better to one of the other exercises. You can develop the small haunches-in volte by spiralling in from a larger circle. 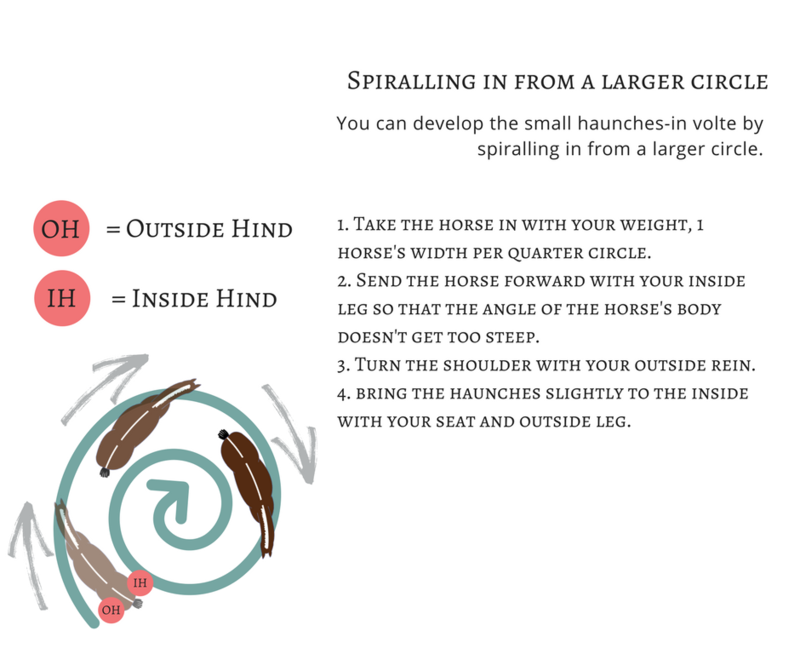 To spiral in from a larger circle, take the horse in with your weight, one horse's width per quarter circle. Send the horse forward with your inside leg so that the angle of the horse's body doesn't get too steep. Turn the shoulder with your outside rein. Bring the haunches slightly to the inside with your seat and outside leg. This exercise is derived from pillars work. You begin by asking for 3 strides of a turn on the forehand in each direction that covers 90 degrees. The horse is bent against the direction of travel, and the inside hind leg crosses in front of the outside one. The first step is relatively large, the second one is smaller, and in the third step, the inside hind leg merely steps next to the outside one. Initially, allow the horse to take slow steps so that he can think about where his feet are and where they need to go next. After the 3 sideways steps, stop, shift the weight in the new direction, and when the horse is ready, ask him to take 3 steps in the opposite direction. Repeat this exercise a few times. Before the horse feels overwhelmed by it, ride forward and change the subject. When the horse is able to step sideways calmly and comfortably, try to eliminate the halt so that you sidestep left - 2 - 3 - right - 2- 3. The more regular the rhythm and tempo become, the more balanced and supple the horse will be. At this stage you often see the first diagonal steps appear at the moment when the horse changes direction. Begin with few reprises back and forth and gradually increase their number, as the horse becomes stronger and more supple. 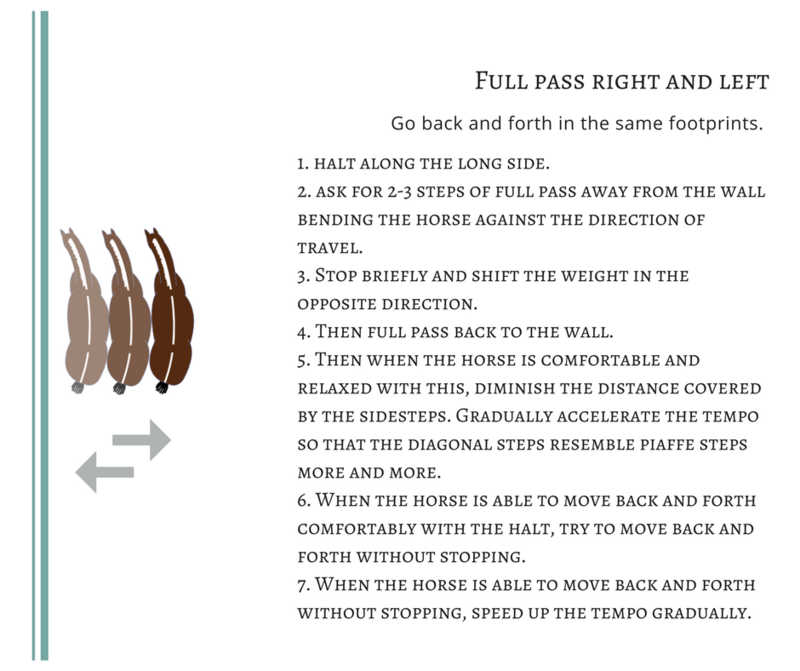 When the horse is comfortable and relaxed in this last phase of the exercise, you can diminish the distance covered by the sidesteps, and you can gradually accelerate the tempo so that the diagonal steps resemble piaffe steps more and more. This exercise requires a great deal of lateral and vertical suppleness of the hindquarters, so you have to ease into it and let the horse “make friends” with it before you increase the intensity. You can apply the pillars principle to full passes as well. You can halt along the long side and ask for 2-3 steps of full pass away from the wall. Bend the horse against the direction of travel. Stop briefly and shift the weight in the opposite direction. Then full pass back to the wall. You can either go back and forth in the same footprints, or you can full pass in 2 steps, advance forward 2 steps parallel to the long side, full pass out 2 steps, advance 2 steps along the wall, etc. When the horse is able to move back and forth comfortably with the halt, try to move back and forth without stopping. When the horse is able to move back and forth without stopping, speed up the tempo gradually. When the horse settles into a steady rhythm with small steps and he feels like a tractor in a low gear, chances are high that he will diagonalize his steps. This is the counter exercise to the pillars exercise. Instead of doing turns on the forehand in motion, you ride turns on the haunches or passades to the left and right. Follow the same steps as in the pillars exercise. Start out by asking for 3 steps of passade in one direction, stop, wait for the horse’s balance to catch up if he lost it. Then ask for 3 steps of passade in the opposite direction, and stop. The next phase of the exercise is to move back and forth without stopping. When that succeeds easily, you can speed up the tempo and reduce the distance that you move back and forth.